German occupation stamps refer to those issued for various European countries that were occupied by the military forces of the German Empire, between 1914 and 1918, or by the military forces of the Third Reich between 1938 and 1945. 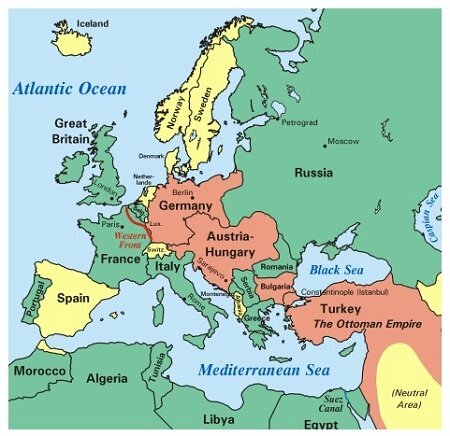 The map above shows the European theater of World War I in 1917. The countries in salmon are the German Empire, the Austro-Hungarian Empire, Bulgaria, and the Ottoman Empire, which were called the Central Powers. The countries in light green are the Allied Powers, and the countries in yellow are the neutral nations. World War I, called "The Great War" or "The War to End all Wars" was the first GLOBAL war. Germany, France, Great Britain, Portugal, and Belgium were all colonial powers, thus you not only had the European nations fighting each other, but all of their colonies in Africa, Asia, and the Pacific were fighting each other, as well. World War I was the first war fought with what we would call "modern weapons", automatic rifles and machine guns, motorized vehicles, and a recent invention of the time, called the airplane! The use of these modern inventions caused devastation on a wide scale, the likes of which had never been experienced in the history of the World, up to then. There are many different German occupation stamps from World War I. As World War I philately has never been as popular with collectors as has World War II philately, they are mostly affordable! The map above shows the Third Reich at its fullest extent in about 1942. The countries in dark blue show the German Reich, its allies, and occupied countries. 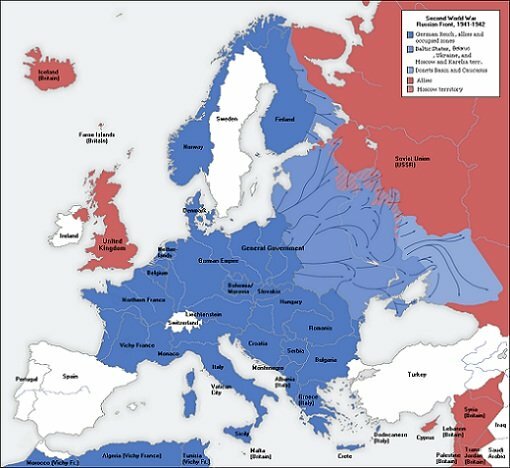 The lighter colored blue areas show the campaigns of the German armies in their invasion of the Soviet Union. The countries shown in red were the Allied nations, and the countries shown in white were the neutral nations of Europe. If the Germans had stopped in 1938, after the annexation of the ethnic German states of Austria, Sudetenland, etc., their regime just may have survived. But, they then invaded Bohemia and Moravia, Poland, France, the Low Countries, and attacked England, triggering the beginning of World War II. And then, in a final feat of insanity, they attacked the Soviet Union, with whom they had a non-aggression pact! Like other empire builders of history -- the Macedonians, the Romans, Napoleon -- they pushed too far, conquered far more than they could maintain and control, and the result was their eventual downfall. Philatelically, the occupation issues of the Third Reich offer immense collecting opportunities. The easy and "safest" states to collect are the General Government (Poland), Bohemia & Moravia, Luxembourg, and Belgium. There are many other occupation issues though. The Eastern European and Balkan military campaigns and occupations yielded many local occupation overprints and postage stamp issues, and quite a few of them are very rare. There are also dangerous forgeries to contend with in this area, so acquisition should be cautious, and only certified copies of the high priced varieties should be purchased. Web page content for most of the German occupation stamp issues will be categorized by war, country, issue, and year, and they will eventually be presented in the Page Link section in the right column. Saar and Danzig, as well as other plebiscite territories, will appear in one or more separate country collecting categories of this website.